Located in the Northwoods of Wisconsin and Minnesota, for over a quarter of a century we have provided a warm and welcoming place to enjoy all of Country Music in our magazine and on this website. Since our inauguration, we continue to feature a 360 degree view of country music that includes all of country music from the Veterans, legends and the Top 10 all the way to the newest entertainers emerging on to the country music scene. As a small publication, at Strictly Country we feature them all! We review all material sent to us under the country music umbrella including albums, singles, movies, videos and books. Country music has grown to include a wide variety of styles. These styles include traditional country, Western, Texan, Country Rock, Country-rap, modern, alternative, Bluegrass, Hillbilly, Rock-a-billy, Americana, Southern Rock, Christmas and Folk. We call this the country music umbrella. At Strictly Country we only feature the best of the best. Although we review all material sent to us under the country music umbrella, we only feature the best music. It is our job to find the finest, most artistic music for you to listen too. Our reviews are based on the authenticity of the music and not on sales charts, popularity charts, others opinions or monetary gain. Six times a year we produce a publication called Strictly Country Magazine. Our publication is found in print and online in a e-zine on this website. Each issue features 16+ pages filled with information on all music and entertainers found under the Country Music umbrella. Each issue includes several features, an Editorial, album reviews, contests and more. In 2016, we included a special on going feature called “The Art of Songwriting” that delves into the process of writing a song. Our most popular issue is our Annual Memorial Day Honors Special issue that hits newsstands on May 1st each year. In this issue we feature songs about soldiers, stories behind these songs as well as other support for our Nation’s Military. This issue sells out within days of hitting newsstands. Each year we close out the year with another popular issue, our annual Northwoods Country Christmas issue. In this issue we feature songs, album and tours regarding the Christmas season. We follow this up with our 2nd most popular issue with the first issue of the new year. This issue features the winners of the Annual Spirit Awards. We provide a wide variety of subscriptions to Strictly Country to match your needs under the country music umbrella. In 1995, Strictly Country hosted the very first Spirit Award show. The Spirit Awards are exclusively a fan voted awards show. To get nominated, an entertainer must have performed within the nine counties that make up the Twin Cities of St. Paul and Minneapolis, Minnesota. All material sent to Strictly Country is dissected by the staff for nomination in categories of Song of The Year Award, Album of The Year Award, Spirit of Christmas Award and Spirit of America Award. Fans can place their vote starting December 10th each year right here at Strictly Country. 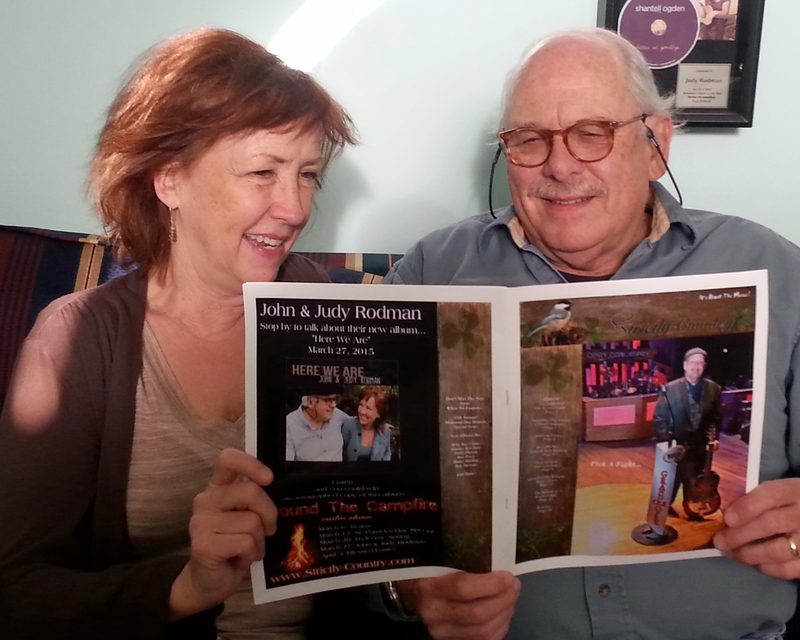 Each week, Strictly Country hosts a weekly radio show called Around The Campfire. Our hosts, Gina and Jack, share with the listeners a wide variety of music that is sent to Strictly Country. Entertainers are also welcome to come in to the office to do the show live. Through the year they also feature Cut-By-Cuts, in which the entertainers share the behind the scenes about their new album. You can listen to the show right here on this website. Twice a year we host a charity event called Fight For The Future Charities. We invite entertainers to donate autographed items to help raise funds for various charities. The current charity that we are working with is The Highground Veteran’s Memorial Park. This event is held in July and December. Strictly Country is not affiliated with any other publication, radio station and or other corporations. We are active members of the Academy of Country Music, The Country Music Association and The International Bluegrass Association. If you wish to contact us please click here. Due to privacy concerns, no where on this website will you find our phone numbers, e-mail address, mailing address or any other contact information other than using the form on our contact page. Strictly Country may be 858 miles north of Nashville; the home of country music, but it's our belief that music, country music is found in every corner of the world. What you see is what you get. What you get is an honest 360 degree approach to a whole world filled with beautiful music. Don't be afraid to come in and join us... Subscribe Now! "Gina Kay Singerhouse loves music. She is generous and kind, but she knows the difference between the good and not-good, the authentic and the fabricated. She’s not afraid to say which is which – with her own amazingly creative writing that makes you smell the coffee. John and I were thrilled to find our music in her good pile. Because the focus is on the real thing, when Strictly Country likes your music, you are absolutely honored and blessed!" "That was the most memorable interview I have ever done! Thanks Gina!" "Thank you for allowing me to talk about my passion!"